An Internet browser is a tool which is very commonly used by each one of us every single day. To exploit it is what makes you smarter and you can do your work really fast, I personally implemented these tricks when I started browsing a lot, it makes my work as speedy as Flash. This browser is for Android 4.0 and up. Its latest version is 3.1. It has an inbuilt video player where you can watch free high-quality videos. Generally, Chrome comes pre-installed in all smartphones nowadays. Though I personally don't like Chrome in Android as it consumes much of my data and RAM of my cell phone. But it works well in PC's, laptops. Opera works well with all kinds of operating systems but it works best with Android. It became very popular around 2008 and since then it has been catering browsing needs of millions. It launched its "Mini" version to initiate data saving. If you want a browser that would save in times of low-speed internet, then UC Browser is the best choice. It works very well in 2G speed. It has inbuilt apps for lifestyle, news, music and videos. Yandex browser is developed by Russian web search corporation. It was released in 2012 and gained popularity very soon. It is simple and easy to use. The most annoying mistake we all do sometimes is closing a tab accidentally. In past, we had to navigate our browsing history to re-open the same tab again, but now most browsers offer a “Recently Closed Tabs List”. So now we just have to press Ctrl + Shift + T and the tab will magically reappear. You can use the shortcut multiple times to open a succession of your closed tabs. 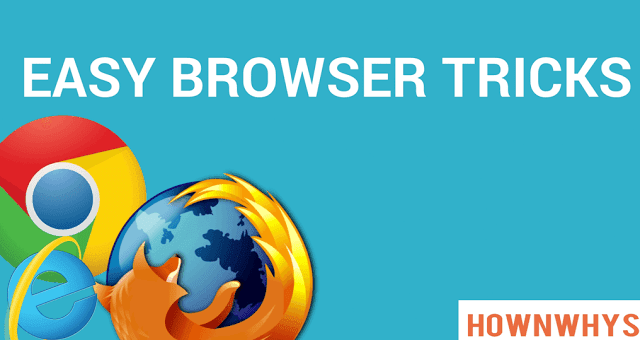 It is a life saver shortcut that works with all kinds of browsers. Perhaps the domain was not renewed or that company went into administration. In that case, try pasting the link into archive.org. They often have old cached versions of sites available. Using keyboard shortcuts is a quicker way than using mouse especially for the typing masters. We all know the common shortcuts of Copy (Ctrl + C), Paste (Ctrl + P) and Cut (Ctrl + X) but this is another great shortcut that’ll make copying an URL very handy. Press Ctrl + L to automatically select and highlight the current site’s URL. Now we can very easily share any link or copy them right away. What we all do very commonly is – typing plain text in Google search box and then ending with a list of search results. We have to go through the whole list to find out that one Site which we want to open. Wouldn’t it be better if we could just reach exactly where we want to? So here is another cool shortcut that’ll make your search accurate and brief. Press Ctrl + Enter, this adds a “www and .com” to your entered plain text. You’ve got a cool picture or wallpaper but don’t remember exactly which site you downloaded it from. If so then don’t worry Google’s Reverse Image Search is there to help you out. All you need to do is head to images.google.com and either click the camera icon in the search box or drag and drop an image from your computer. Have a practice of making notes while browsing? And didn't get a pen and paper handy? No problem at all. But also remember you cannot save your notes, so don’t accidentally close the window till you’ve copied your notes to a more secure place. Alt + Tab is one of the most common keyboard shortcuts that let you move between various program windows on the Taskbar. Well, browsers also have a similar function. Just Press Ctrl + Tab and it will move you one tab towards the right, while Ctrl + Shift + Tab will move you one tab to the left. On Chrome and Firefox, you can also use Ctrl + 1-8 to jump straight to a tab, with the number used corresponding to the order of tabs on the top of your screen. These tricks are basically for the desktop version of the browser. Whilst the Android version would have other ways to enhance your web browsing experience. It happens sometimes that the browser starts loading pages slowly. Its reasons could be many but the most common one is the cache memory. Too much search history fills up your RAM, leading to slower browser speed. Therefore this shortcut is very much important for anyone. To clear Cache on the go just Press Ctrl+Shift+R and then refresh the page. Your browser will start working at its full potential again. Incognito window proves to be very helpful sometimes. It does not only keeps your search private but also helps you to do safe banking transactions. I personally use incognito mode for making any bank transfers or checking my bank account balance. Therefore this shortcut is also very important for us. It is just like opening new tab Ctrl+N, you just have to add Shift to go Incognito. To disable autofill settings in Chrome you have to go to SETTINGS and scroll down to the bottom of the page. Go to Passwords and Forms and uncheck the box in front of "Enable Autofill to fill out web forms". Hope you like this article on " 10 cool browser tricks". You can also read about blogging, informational articles and much more. Share your experience with us in the comments below. Easy Adventure Sports: 12 adventure sports you must plan with your best friends. 5 Best 16mp camera smartphones under 15000.